Every year when Allison's birthday rolls around I always ask what kind of cake she wants and if she would prefer a store bought or those of the box variety or one from scratch. This year she requested a peanut butter cake and had no preference of where or how it was made only that it incorporate lots of peanut butter. 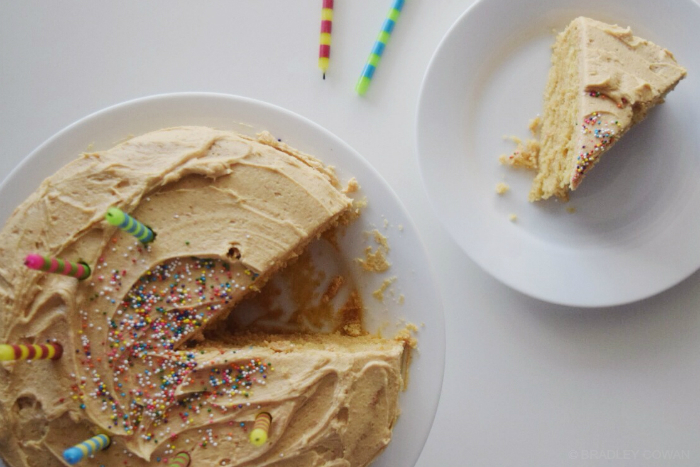 I searched through numerous recipes before finally drooling over this one and with a few minor adjustments, Allison's Peanut Butter Birthday cake was created... and it's delicious. Preheat the oven to 350 degrees. In a medium bowl sift the flour, baking powder, baking soda, and salt then set aside. In a large mixing bowl add the peanut butter, oil, and brown sugar beating until combined and creamy. Add the eggs and vanilla extract and beat just until combined. Alternately add the flour and buttermilk to the wet mixture, starting and ending with flour, beating just until combined. Be careful not to over-beat or the cake will be dense/dry, a few small lumps of flour is fine. Grease two 9x3 inch round baking pans and pour the batter, dividing it evenly, into the two pans. Bake for about 15 minutes or until a toothpick inserted in the middle comes out moist; if the toothpick is wet with batter, bake a little longer, if the toothpick is dry then the cake will be dry. Let the layers sit in the pan for 5 minutes then invert the cake onto a wire rack to finish cooling. 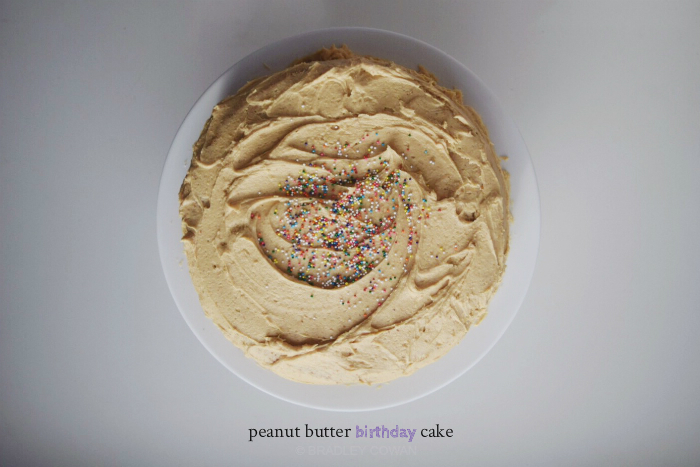 Place the peanut butter and butter in a large mixing bowl beating until smooth and creamy. Add the powdered sugar one cup at a time, continuing to beat then add the heavy cream until you reach a spreadable consistency. This will be a fairly stiff frosting. Frost one layer and down the sides then place the other layer of the cake on top of the now frosted bottom layer; frost the top layer and down the sides using as much frosting as desired. Then have your toddler dump some sprinkles on top... optional, of course.